Have some fun with your embroidery machine!! 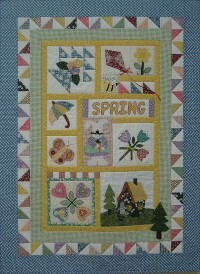 This project was made using the The Stitch Connection's Changing Seasons Spring Embroidery Disk. The kit includes the makings for a 33" x 45" wall hanging, a CD that has two styles of machine embroidery: Filled Work using all thread or Partial Applique with some filled work. Quilt instructions also included.